The Liebherr 2017 ITTF-Men's World Cup played out its final day on Sunday 22nd October and as expected there was plenty of drama for the spectators to digest. Here is our quick roundup of Day Three's action in Liège, Belgium. Starting the day with semi-finals fixtures, the four remaining contestants took to the tables aiming to progress through to the gold medal contest. Ma Long was hoping to add a third Men’s World Cup title to his trophy collection and looked well placed to achieve that feat when the World no.1 sailed into a commanding lead. However, standing at the opposite end of the table was Timo Boll, who had pulled off a remarkable recovery in the previous round against China’s Lin Gaoyuan, and the German star was at it again in the last four defeating Ma Long across seven games (6-11, 9-11, 11-9, 9-11, 11-7, 11-5, 12-10). The other semi-finals fixture produced another win for Germany as Dimitrij Ovtcharov came out on top against Frenchman Simon Gauzy. Second seed Dimitrij Ovtcharov required the full distance to see off the seventh seeded contestant Simon Gauzy (6-11, 11-2, 11-8, 10-12, 7-11, 11-4, 11-8) to guarantee the top two steps of the podium for Germany. Two further matches followed the conclusion of the semi-finals, the first of which saw Ma Long seal his spot on the medals podium with a positive display against Simon Gauzy (11-5, 11-13, 6-11, 11-5, 11-7, 11-9) in the third place play-off. Despite missing out on the gold medal, Ma Long maintains his 100% podium record at the Men’s World Cup. 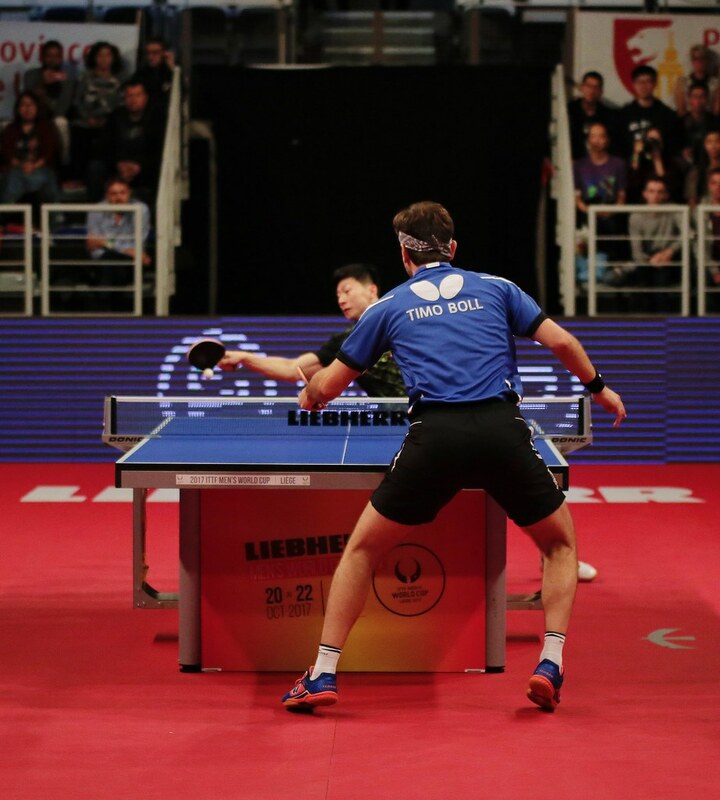 Then came the main event as fellow compatriots Dimitrij Ovtcharov and Timo Boll met face-to-face for the title. Nothing separated the two German competitors by the conclusion of the opening four games of the final, but Dimitrij Ovtcharov ended the match as the stronger player and eventually secured the trophy with a six games victory (10-12, 11-8, 11-7, 9-11, 11-7, 11-2). Dimitrij Ovtcharov failed to progress beyond the Round of 16 at last year’s edition of the tournament in Saarbrücken but one year on in Liège he becomes the third German player to lift the Men’s World Cup trophy, joining Timo Boll and Jörg Rosskopf in achieving the feat.